Why do you volunteer for Feel the Magic®? I volunteer because it helps me ground myself in my grief and it really makes me feel like I’m surrounded by family and I truly am – Feel the Magic® has become a second family to me which allows me to express feelings and emotions that is something normally really hard for me. What is your favourite season and why? My favourite season is winter because it allows me to express the deeper emotions that I need to get to spring and summer. What is your favourite part about camp? It’s really hard to decide my favourite part of camp because the whole thing is just amazing! Right from when campers get there to when campers leave, it is packed full of fun and friends that are made there are always going to be friends for life. I’m still friends with people from the very first Camp Magic® and I’ve made new friends as a mentor! What’s the best piece of advice you’ve heard about grief? I would say the best piece of advice I’ve heard about grief is that there is no right way to grieve. Everyone had a different relationship with their loved one, therefore, they have a right to grieve differently to someone else. Everyone is allowed to be themselves in their grief. What inspires you about our campers? Camp Magic® campers are by far the strongest people I’ve met. The older kids, the younger kids, all of them. These kids have been through the worst that adults shouldn’t even have to deal with and these kids have lost everything at such a young age and some have been traumatised by this grief and the journey they had to take to get to the grieving stage and they are still shining bright and laughing and cheering each other on and having fun like nothing has ever gone wrong in their life. A personal note from Caelin to James and Kristy: Kirsty and James Thomas have truly changed my life. The best thing my mum has done for me these past five years is send me off to Camp Magic®. There were times where I refused to go but was forced to anyway, but I came back again and again and I’m now a mentor and that’s because of Kristy and James’ programme. It has changed my life and has allowed me to bring out a confidence that I didn’t know I had and I created friends with people that I’m still friends with today and it’s been years since the first camp. It doesn’t feel like a school camp that mum forced me to go on. It’s more like staying over at my auntie’s house where all our cousins are around and it’s just pure fun and connection. Caelin (at left), with her mentor, on her first camp in 2015. 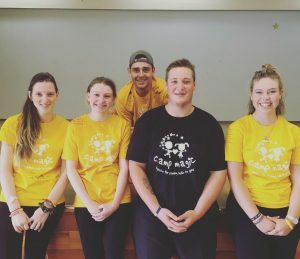 Caelin, at left, with four other campers who are now trained as mentors. If you too would like to volunteer at Feel the Magic®, click here to learn more and apply online.